Choose a CC to limit within a certain range. multi channel key range/transpose midi plugin. It acts on any channel, and when on, any cc assigned to increase/decrease transpose will be filtered. 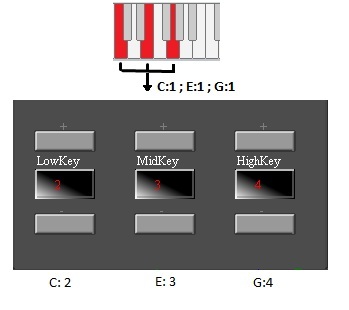 Some buggy midi controllers will send more than just a 127 and a 0 value when you don’t want, this is to prevent any clandestine cc to get thru, which otherwise would ruin, for example, tempo tapping. When enabled, only one message of the CC you specify (and only the values 127 or 0 get thru) will be allowed within the defined time period. Just a test tool, instead of sending the cc64 (sustain) out, it will filter it and mimic its effect with note on’s/off’s. Inverts a CC’s value (i.e. , if it’s 127, it will become 0), this is aimed at inverted sustain pedals, some older controllers don’t have the option to reverse the polarity. Remaps aftertouch/channel pressure to the desired CC. introduces a configurable random delay on every note on message, up to 200ms (which is clearly too much). For example, to provoque slight timing drifts in layered instruments of a brass section. Define an origin channel, a destination channel, and a CC to change the routing from original->dest. note: any midi message except note on’s from the original channel will always be doubled into the destination channel as well, this is to prevent any surprises. Instead of a CC, any velocity value above the specified trigger will change the note’s channel. Except this difference, all the rest from above applies. A very simple metronome for practicing purposes, outputs audio or midi “ticks” (configurable channel/notes), can be run synchronously or asynchronously with the host’s tempo. I made this for making brass section chords. If you only play one note, the original channel will go thru unchanged. When 2 or 3 notes are played at the same time, the original channel will be routed to the ones defined for low/mid/high notes. the channel change will be made, and new note-ons will be sent again. Hi there. Your MIDI plugins look like they could be very useful in my setup which includes Cubase and EnergyXT. Only thing is the download link http://www.mediafire.com/jstuff doesn’t work. Looking forward to trying them out. Thanks for all your work. It seems that some antivirus/firewall software don’t like mediafire very much. I’ll try to find an alternate link. Hey, what’s your email address? I want to email you in private and you don’t have any contact information here. Works like a charm thank you and well worth the money XD!! DUDE! I’ve been searching for something simple to invert the sustain pedal instead of diving into Midiox and trying to figure out all that crap or getting out the soldering iron. I’ve been at this problem for hours. Awesome and simple! Thanks huge!